I think the Solar Decathlon is one of my very favorite events as well as one of the most important competitions we cover. Any time you put a bunch of unfettered enthusiastic and passioate students on the playing field, good things can result. This year there are 20 teams participating from all over the world. 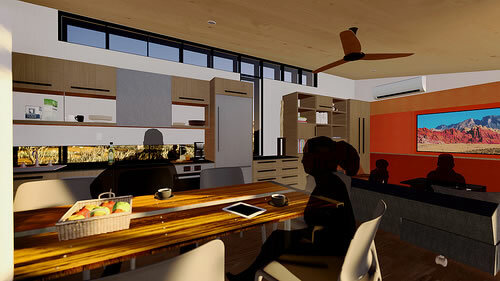 Team Austria's U.S. Department of Energy Solar Decathlon 2013 entry is a simple, smart, and sustainable house. Powered by a rooftop solar photovoltaic system, Living Inspired by Sustainable Innovation (LISI) generates more power than it uses over the course of a year. The house adapts to a range of climate zones and flexes to meet a variety of lifestyles. In developing LISI, Team Austria was guided by a vision for a healthy, sustainable future and a concept that could adapt to many lifestyles and climates. Viewing the house as a "social creature" eager to find its place in a richly diverse community, Team Austria honors a sense of stewardship in the use of our planet's most precious resources. Renewable and eco-friendly construction and insulation materials made of timber are easily transported and provide indoor climate comfort and carbon-neutrality. Changeable architectural elements create a variety of sensory conditions—closing to form a protective cocoon for occupants and opening to allow them to expand their space. Two patios create a balance between interior and exterior and public and semi-public spaces. The passive solar design, combined with an automated screen and awning system, provides shade to keep the living spaces cool and comfortable. A patio herb garden draws water from a rainwater reservoir. Generous storage, completely integrated into the walls, frees the primary indoor space from clutter. Photovoltaic modules provide an annual surplus, which can be used to power electric bikes or vehicles. A centralized utility room contains all the automated mechanical systems the house needs, including a photovoltaics monitor, ventilation, plumbing, and hot water supply. Two high-efficiency, air-water heat pumps supply cold and hot water for space heating and cooling as well as for domestic hot water. An energy-recovery ventilation unit acts as a heat and humidity exchanger between exhaust air and fresh intake air to keep the living spaces comfortable and healthy. A multifunctional subfloor system regulates the indoor climate using water, air, and active cubic capacity. A heat-recovering shower tray reduces the energy demand for hot water by almost one-third. Through a tablet application, the automated house control hub, energy performance history, and live data can be accessed in an intuitive way. 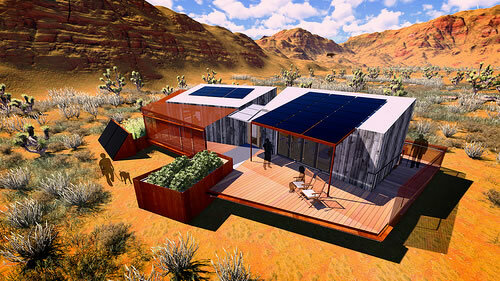 The University of Nevada Las Vegas designed its DesertSol house to reflect the spirit of the Mojave Desert. With reverence to the sun as both a source of harsh conditions and a solution for sustainable living, DesertSol harnesses abundant sunlight for solar electricity while capturing rain to provide evaporative cooling and irrigation. The ultra-efficient house is envisioned as a vacation home for a seasonal retreat—a basecamp for desert adventures that responds to its unique environment. DesertSol makes careful use of the desert's solar and water resources. Its design fuses modern architecture with a weathered aesthetic, the comfort of carefully selected materials, and the excitement of intriguing spaces to foster a spirit of openness and adventure. A weathered wood rain screen shades the building's structure. Digitally fabricated retractable solar shade screens shield the hottest sides of the house in the summer and provide direct sun for warmth in the winter. A water feature captures water from the occasional desert downpour and uses it for irrigation and spot cooling on the outside deck with a cool tower, which uses less water than conventional misters. Folding doors open completely, allowing indoor activities to spill onto the outdoor deck space and doubling the square footage for entertaining. A home automation system ensures the house operates at peak efficiency and allows the lights, appliances, and thermostats to be controlled from an easy-to-use interface on a mobile device. Photovoltaic panels provide electricity and shade the outdoor living space. Solar thermal collectors provide radiant floor and water heating. Advanced structural design framing clad in reclaimed pre-weathered materials saves lumber and provides more insulation to the living spaces. A fire-protection sprinkler system combined with a potable water plumbing system ensures that fresh water is available each time a cold-water fixture is used and results in a non-stagnant sprinkler system. Layers of closed-cell, open-cell, and continuous rigid insulation ensure that the house is air-tight and highly heat-resistant and prevents thermal bridging. 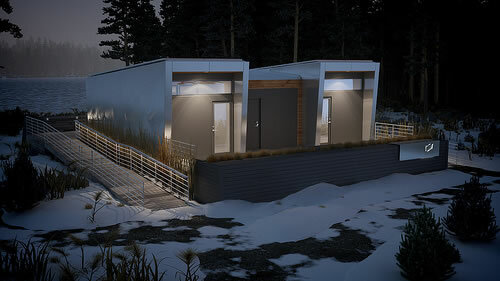 Borealis, the University of Calgary's entry to the U.S. Department of Energy Solar Decathlon 2013, addresses the housing needs of professionals working in remote locations, such as the northern regions of Alberta, Canada. 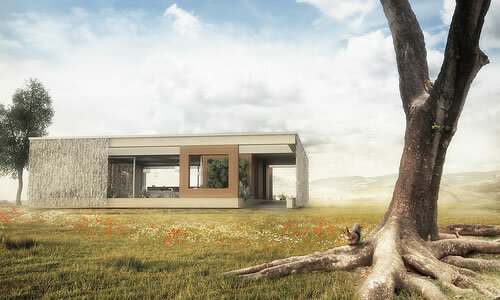 This modular house is easy to transport and assemble, it's affordable, and it provides a comfortable and sustainable home away from home. 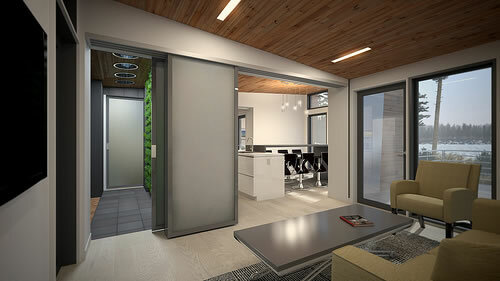 Borealis was designed in consideration of the housing shortages and high housing costs driven by northern Alberta's resource industries (energy, mining, and forestry). It provides an alternative to crowded work camps and brings a solution to the difficulty of finding labor to build housing in these areas. Named after the iconic Northern Lights and lush Boreal forest, Borealis is designed to be sustainable and ecologically sensitive. 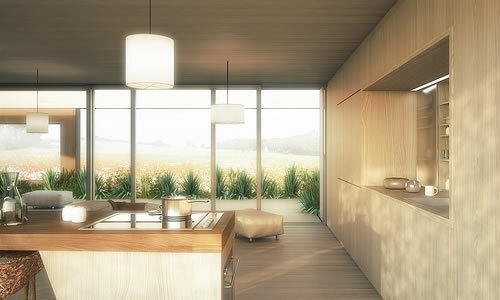 The three-module design features a core shared module with a kitchen that separates two private modules that can be configured as work or rest spaces. A living wall in the bathroom hosts plant life for cooling, air purification, and connection to nature throughout the year and is sustained by large sun-tunnel skylights. Exterior cladding uses sustainable products such as responsibly sourced, naturally moisture- and rot-resistant cedar wood siding and fiber cement boards that use post-industrial waste wood fiber. Large, south-facing windows provide natural light and views to the outdoors and open to provide passive cross-ventilation. A roof-mounted solar photovoltaic array is controlled by a system that monitors individual panels to allow site-specific array optimization. Micro-inverters allow maximum production of electricity from every panel without the array being dependent on any one panel. Light-emitting diode fixtures are used throughout the house to achieve ultra-high efficiency and use 10 times less energy than traditional incandescent bulbs. A custom energy monitoring system provides feedback on the lighting, appliance, and mechanical loads and enables optimization of the mechanical system at any location using a simple Web interface. The central mechanical room controls all activity within the house from one location. A solar water heating system harnesses the sun's energy to heat domestic hot water.